Presently, both locations share the probation department which is located at the Sterling Heights division. 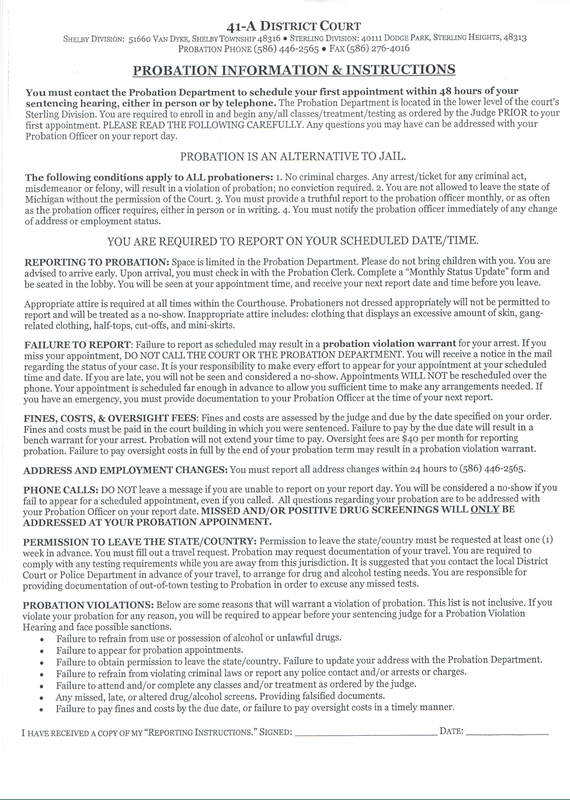 In addition, any offenders placed on reporting probation are required to report at the Sterling Heights location. The 41-A District Court in Shelby Township has been seeking funds and approval to build a larger facility based upon need. We expect this to occur in the near future given the geographical area and growing population which is serviced by the Shelby Township division of the 41-A District Court. See recent link regarding court relocation information. The district courts in Michigan (including the 41-A District) has jurisdiction to sentence offenders for misdemeanor criminal offenses which can carry up to 1 year in jail. In addition, the district courts may impose probation for a maximum period of 2 years. Click here for a blog which we posted which covers the Most Prevalent Misdemeanors in Macomb County District Courts. Upon sentencing, a person may be sentenced to serve time in jail followed by a term of probation or probation may be ordered immediately with the possibility of jail only upon violating the terms of probation. In addition, probation may include the component of “reporting” to the probation department at a frequency which the Judge will order; usually once per month. Non-reporting probation is also a possibility for offenders that do not require monitoring by the probation department. Non-reporting probation is preferable and can be argued at the time of sentence. Probation is a serious matter. Probation is provided as an alternative to jail. A person that cannot comply with the terms and conditions of probation faces probation violation, probation termination and possible incarceration. A violation of probation can also mean losing the opportunity to get a criminal charge dismissed whenever compliance is a requirement to earn a dismissal of an offense (see MCL 333.7411 for drug crimes, MCL 769.4a for domestic violence). The form also states that a “ticket” will result in violation of probation. Our experience is that a ticket, such as a non-criminal traffic civil infraction, will not ordinarily result in a violation of probation provided it is disclosed to the probation department or to the court. One should think of probation as a contract or agreement with the court. The court gives something (probation) and the offender gets something (avoidance of jail). The court or judge will honor the agreement provided the offender abides by the terms of the contract (terms of probation). If the offender fails to abide, the court may consider the contract null and void (terminate probation) and impose jail. Probation violations can result in jail time and the assistance of an attorney is essential. Upon being found guilty of violating probation, the Judge can sentence a person to the maximum remaining jail time which has not been served. For example, possession of marijuana can carry up to 1 year in jail. A first offender who is found guilty of possession of marijuana usually will receive 1 year probation with a dismissal at the end of 1 year upon compliance with probation (see MCL 333.7411). However, if the offender violates any term of probation, he or she can get up to 365 days in jail, minus any jail time that has already been served for the offense.